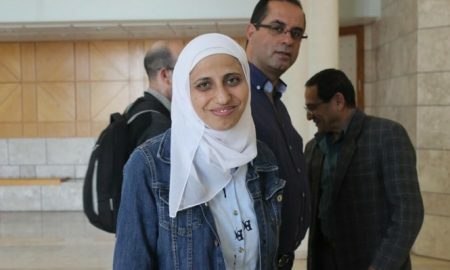 Palestinian poet Dareen Tatour testified before the Magistrate’s Court in Nazareth on Thursday, 26 January; Dareen’s saga has lasted for nearly a year and a half as she faces prosecution and imprisonment for writing a poem, “Resist my people, resist them,” and posting it on YouTube. Arrested from her family home in the village of Reineh on 11 October 2015, Tatour, a Palestinian citizen of Israel, was imprisoned for several months in Kishon, Damon and HaSharon prisons on allegations of “incitement,” and she was then transferred to house arrest. For several more more months, she was confined to an apartment in the Tel Aviv area; due to the restrictions of her house arrest, her brother and sister-in-law had to leave work and school to permanently accompany her; she was finally transferred to house arrest in her home village of Reineh but remains subject to severe restrictions and must wear an electronic ankle bracelet at all times. She is prohibited from using the internet. Hundreds of internationally renowned writers and artists, including Edwidge Danticat, Ahdaf Soueif, Alice Walker, Eve Ensler, Ariel Dorfman, Russell Banks and Barbara Hammer, have called for Tatour’s release and the dropping of charges against her, a call endorsed by PEN, the international freedom of expression association. Despite the widespread support for Tatour and the almost farcical nature of the charges against her, she faces up to eight years in prison. The arrest and prosecution of Tatour also comes in the context of a long history of occupation persecution of Palestinian writers and artists, including such former prisoners as Mahmoud Darwish, Samih al-Qasim and Tawfiq Zayyad, like Tatour, Palestinians from occupied Palestine ’48. Despite the lengthy proceedings stretching over four months, Tatour’s case will continue for several more hearings. There will be three more upcoming hearings in the case before a judgment is issued, and those sessions will convene on 19 March, 28 March and 5 April. Learn more about the case at the Free Dareen Tatour facebook.